The Allagash Wilderness Waterway begins in sight of Mount Katahdin, the highest peak in Maine. 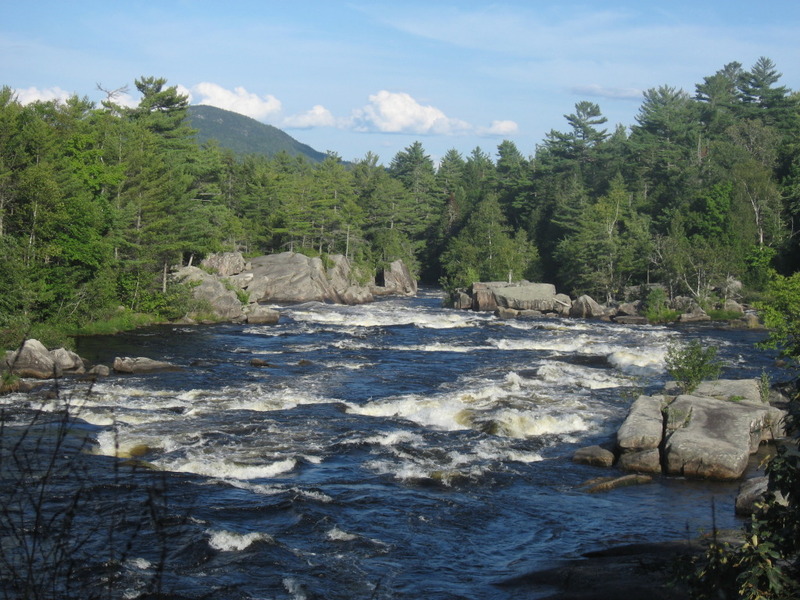 Running ninety two miles from lakes west of Katahdin, it ends where the Allagash River, meandering north, runs into the St John River on the Canadian border. In the mid-eighties my fourteen year old son Gabriel and I joined with eight other men for nine days to canoe the Allagash Waterway. We planned logistics, food, equipment – a duty roster calendar and menu for each day: cooking, clean up, water and wood gathering. Two other father and son teams with young men near Gabe’s age, along with a pair of late teens and Father Wilifred Gregoire from Westerly, Rhode Island, partnered with a parishioner who was his friend. Father Greg was an experienced outdoorsman, an Allagash veteran with more than a half dozen previous excursions. Milton Wilbur from Woonsocket, another Allagash veteran, accompanied by his son, Josh, led the trip. A wilderness canoe trek takes on its own sedate, steady rhythm: rise at dawn; stretch out the previous day’s muscle stiffness; early fire over the previous night’s coals, cowboy coffee and breakfast, clean up, break and pack the camp; put in and begin to paddle – mostly J strokes, slow and unrelenting with little respite; the sound of the water and occasional sighting of deer or hawk or a trout breaking the surface; find a suitable spot for lunch; maybe a swim if the sun is warm; put in for the afternoon miles; locate our planned evening campsite, stake down and raise the tents, roll out the sleeping bags; draw water at a spring, forage for blowdown wood and light the evening campfire; cook and eat dinner, clean; quiet talk around the fire; some nights camp songs with men used to singing together; perhaps some reading or a fold out chess set; more quiet talk with my son in the sleeping bags for the night; deep sleep two to a tent. The rhythm corresponds to the backdrop perfectly. Utter peace. Hard pulling and the soreness disappeared after a day or two. Gabe and the other young guys held their own in the canoes without complaint. Bathing was with Dr. Bronner’s phosphate free, biodegradable peppermint soap in the lakes and river. Shaving was left behind. On Sunday morning, we changed the rhythm without breaking it. Father Greg celebrated an evening Mass before dinner with us as we neared sunset under the canopy of a stand of Eastern White Pine on the shore of the far end of Chamberlain Lake, sharing prayer and our faith. Singing our worship songs of thanksgiving in the silence of the vast Maine woods. The early days of the trip were the most physical, sometimes fighting wind driven swells, which broke on the shore of Chamberlain. The outfitters met us at our jumping off spot after we followed a fifteen mile dirt road to Telos Lake and there delivered our five canoes – well worn, but sound, aluminum, Grumman made, flat bottomed for the river, but tricky to manage on the lakes in a wind. They drove our van back and waited for our call in nine days from the payphone in Allagash, while we paddled north. Telos the first day, tired from an all night drive from Rhode Island; the long miles of Chamberlain, portages to Big Eagle Lake, the long haul up Eagle into Churchill Lake; portage at the top of Churchill Dam to a stretch of river that flowed into Umsaskis Lake, which empties into Long Lake; past Long Lake Dam and Cunniff Island, and finally picking up the aid of the Allagash River current for the rest of the way except for an hour or so traversing Round Pond. On the big lake, we looked up once to see Milton and Josh deploying a clamp-on sail and disappearing ahead. Experience counts. One long day on the river, a bald eagle followed us for hours, probably looking for scraps. He would settle in a tall hemlock or pine, wait for us to pass, rise effortlessly and glide past us to his next vantage point along the river. On another day, we took a brief hike into the woods between Chamberlain and Eagle Lake to show the boys two railway engines, stranded in the forest sixty years earlier when the logging tramway rail system was abandoned. They climbed happily through, over and around the old boilers and controls. A third diversion when we hit a long stretch of rapids, nothing too challenging, but we had to pay attention. The rangers, who kept an inconspicuous eye out for the safety of the various groups, picked up the gear we left near a woods road log bridge. We had an adventure down the rapids with only bathing suits, life jackets and sneakers at risk. They dropped off our tents, sleeping bags, clothes and provisions, safe and dry, at the end of the rapids, when the descent flattened out and the river widened once again to a more temperate pace. The teen team, Keith and Dave, stood up, then when that failed to capsize them, stood up backwards and finally went down one section of rapids with one on the shoulders of the other. They went in and swept along by the current finished the rapid run laughing riotously. No nanny state for these young lunatics. On our last day before we made final landfall in Allagash and swapped our canoes for our van, we pulled the canoes up on a sand spit for lunch and played for several hours at Allagash Falls, where all of us were boys again, splashing in the cold deluge, slithering over the ancient, smoothed rocks like a waterslide freely provided. The pre-Socratic Greek philosopher, Heraclitus, wrote that one cannot touch the same drop of water twice in a torrent and that “no man ever steps in the same river twice, for it’s not the same river and he’s not the same man.” My memory rusts like the train engines, becomes a bit idealized perhaps, but the Allagash changes us in some undefined way for the good. There is in Nature, for sure, tooth and claw, blood and fury, but there is also in untamed places a feminine aspect: fertile, bountiful, generous with great peace found no other place – a time for thoughts and no thoughts, a time merely to be. I wasn’t there, but I feel like I was. A special thanks for this one. Maine was a true blessing in our life for many reasons, but the natural surroundings, even with the long winters and the Easter Egg hunts in the snow, are deeply a part of us. She will have to tell you the story. One year with an early Easter, snow was still on the ground. The elementary school enlisted some of the mothers and hid brightly colored eggs in the snow on the school grounds. By the end of the winter, there wasn’t much we wouldn’t do to entertain ourselves. Sounds like a blast! What a well-written and evocative piece, Jack. It was amazing how you managed to compress the essence of the entire trip into a handful of paragraphs. Like Rita, I feel like I was there. OK I admit I got choked up on this one. The vivid memories were so easily retrieved upon reading your almost tactile descriptions. 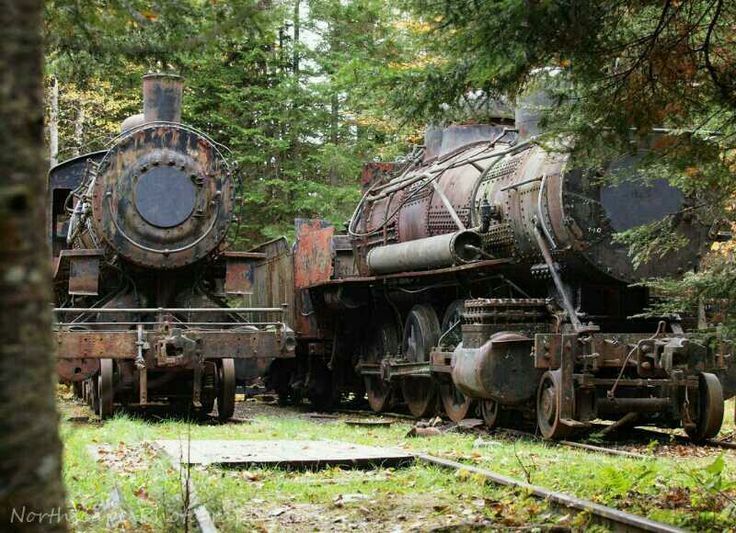 The rusted train engines! There is a photograph floating around somewhere of us jumping from one to the other. Man that was a fun trip. Thank you dad.